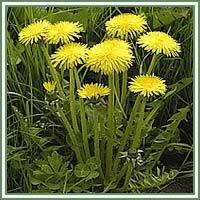 Habitat: Dandelion is native to temperate regions of the Northern Hemisphere. 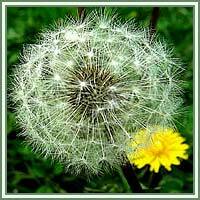 Description: Dandelion is a tap-rooted biennial or perennial, herbaceous plant. It has a rosette of leaves emerging from the central taproot. Leaves are usually 5 to 25 centimeters long, simple and basal. Solitary flower heads are borne on the top of the hollow stems. Flowers are yellow to orange, closed during the night. The flower heads are yellow to orange colored, and are open in the daytime but closed at night. Each flower consists of hundreds of miniature ray flowers. They mature into white, globular seed heads. Those seed heads consist of numerous, single-seeded fruits, known as achenes. Each achene is attached to a little, finely-haired “parachute” called pappus, which enables the wind-aided dispersal of seeds. Useful components: Calcium, potassium, iron, manganese, proteins, carbohydrates, beta carotene, luteolin, caffeic acid, vitamins A, C, H and K.
Medicinal use: Dandelion is considered to be an excellent general tonic and a “natural” diuretic. Dandelion tea has shown to be very helpful as a liver detoxicant. It also improves functions of gallbladder, pancreas, spleen and intestines. Dandelion can reduce inflammations in cases of hepatitis and cirrhosis, help gallstone dissipation and improve kidney functions. Dandelion tea can also be useful in treatment of constipation, indigestion and other digestive disturbances. The sap from the root and stem can be applied externally in cases of sores, warts, acne and bee strings.